Whitey Bulger trial: Should John Martorano be at the defendant’s table, with Whitey testifying against him? Should John Martorano be at the defendant’s table, with Whitey testifying against him? 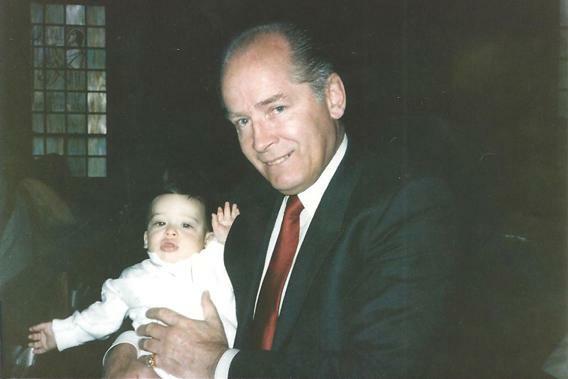 In this undate photo, James “Whitey” Bulger holds John Martorano’s youngest son, John Jr., during his Christening ceremony. Martorano is now a witness in the Bulger’s prosecution. At this point, I think most impartial observers in the courthouse would like to see this evil person—who lives the life of a free man, remarkably—receive some sort of comeuppance. At 11:27 a.m., we get the best we can hope for: cross-examination. I’m imagining defense attorney Hank Brennan pacing in circles around his living room last night, pressed suit on its hanger, practicing his opening question again and again. When Brennan strolls to the podium this morning, he’s raring to go. He eyes Martorano and begins his cross. That’ll wake up a courtroom. “I don’t think so,” Martorano replies, with the slightest of squirms. It’s not clear which part of the statement he objects to. He has confessed to shooting unarmed people in cold blood. So unless he’s devised an elaborate, Jesuitical argument it seems pretty fair to term him a “murderer.” Does he feel that a mere 20 murders do not justify the modifier “mass”? Do you earn that word only after you’ve killed, say, 35 or 40? Or perhaps Martorano interprets the phrase—if you’ll allow me to get vaguely Jesuitical myself—as a reference to murder in a Catholic church during the Eucharist? 2) When a man named John Banno came at Martorano with a knife, outside an after-hours club, Martorano grabbed the knife away and stabbed Banno in the chest with it. Banno wouldn’t give in, so Martorano stabbed him again—20 times, according to later reports. Brennan now hectors Martorano on the stand, asking why he’d keep stabbing an unarmed, bleeding man. Martorano deflects, deflects, deflects … and then finally erupts, “ ’CUZ HE WOULDN’T SHUT UP!” He adjusts his glasses and tries to regain his composure. Brennan pauses for a few beats, letting the outburst echo around the silent courtroom. If I were on the jury, I’d be profoundly confused about the import of today’s testimony. We heard a whole lot about the crimes of John Martorano and only a little about the crimes of Whitey Bulger. Mostly, what we learned—or at least what I learned—is that Martorano is a straight-up, horrifying sociopath. And frankly, based on what we’ve heard in court thus far, it seems like Martorano should be at the defendant’s table and Whitey should be testifying against him. Meanwhile, it is increasingly inconceivable to me that Martorano isn’t in prison or dead by the hand of a state executioner. Twenty murders, of the very coldest kind. Assassinating a man who had zero ties to organized crime, strictly for money. Wantonly shooting an innocent woman in the head. This guy lives among us? And has for the past half-decade? We should be genuinely frightened and appalled. Martorano pays lip service to remorse, but his frequent smiles, chuckles, and defensive answers betray him: He’s not sorry. He thinks he deserves to be free. And I have no doubt he’d take up crime again if it suited him. “Who told you it was OK to murder someone to protect your friends and family?” asked Brennan.